Well as you are all aware Leeds Festival tickets are well on sale and there are still bands to be announced on an already amazing line up! I mean wow, Arctic Monkeys, Blink 182, The 1975, Disclosure, Jake Bugg, The Courteeners, You Me At Six and many other amazing bands. I officially can’t wait. This is my first big festival I’ve been too which makes me ever more excited and I’m also going with a great bunch of friends (of course this is an essential). So my tickets are already purchased as well as my early bird ticket (may as well go all out), and I had a great idea to put that little bit extra aside for of course ALCOHOL, food and the camping essentials. Since I work as a waiter, I tend to have lots of loose change from tips at the end of every shift and I usually spend them on my lunch at uni or put them aside and change it all into notes when I get a lot together but this year I’m doing something a little bit different that all of you could do too! I found this large jar around the house and I’ve decided to turn this into the LEEDS FUND jar. 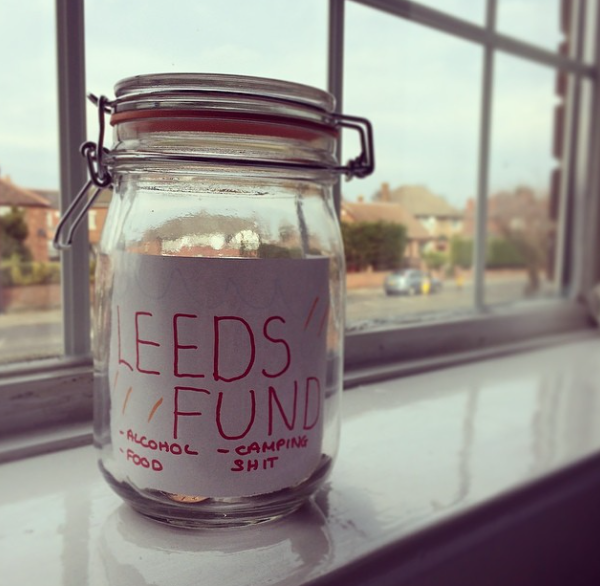 Yes, a leeds fund jar. So when it comes closer to the date, I can cash it all in and buy the necessary essentials with this money. I think its a brilliant idea especially for the lose change I mentioned before. So if you are going to Leeds Festival or any other festival this year… Give it a go and see how much you can save from just lose change! Thanks for reading guys and check out my social links below, the picture today was taken from my instagram account @giannic_ so feel free to give that a follow for daily pictures.